Home / The Films: Jason Lives / Bus Monitor's Cut Death In Jason Lives? Bus Monitor's Cut Death In Jason Lives? Last July, a bit of interesting news surfaced pertaining to Jason Lives: Friday The 13th Part 6. Director Royce Freeman was hard at work finishing his newest film, ‘Rapture’ and needed to shoot some additional scenes.. While casting extras for those scenes, he hired actress Sheri Levine. 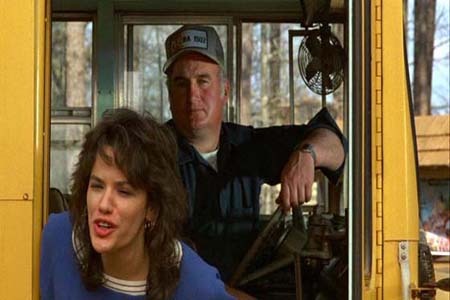 Sheri played the bus monitor of the bus that drops the kids off at Camp Forest Green in Jason Lives. According to Royce, the two were chatting during the filming of the extra scenes and Sheri mentioned that she had a death scene that was cut from Jason Lives! Royce mentioned that she did not elaborate on what the death was or how it fit into the film other than saying that there were a few other moments leading up to her death. This was indeed an interesting revelation as Sheri’s role was so small that it doesn’t seem like her character’s death would be that significant. I followed up with Royce a few months later in October 2010 and he mentioned that he did not have the opportunity to find out more from Sheri about her supposed deleted scene. This is one instance of a cut scene fans might like to find more information about. At this time we still cannot confirm if there was a planned death for her character. The shooting script and call sheets we have in our possession do not outline her characters death, however, there are a lot of deaths that appear in the film that were not written into the original script. It is possible that during filming, Sheri's bus monitor character could have been talked about as having an impromptu death scene, but there is just no record of this to be found. There will be more to follow on this as information becomes available!